Josh is a Lawndale High student in Daria's year, in the same English/Language Arts classes as her. His name comes from Mr. O'Neill's seating chart in "Cafe Disaffecto". He always wears the same blue zip-up tracksuit jacket, darker blue baggy cargo pants, and white trainers - "Antisocial Climbers" shows he has a winter ensemble with the same colours and bagginess! - and usually has a very cool/bored expression. In "Fair Enough", he can be seen carrying a skateboard. Josh has avoided the camera's spotlight and shows little of himself, but "The Daria Database" showed him with a grim expression as he attempted a Philosophy exam. In "The Misery Chick", he's present at Tommy Sherman's most fateful game, alongside classmates Kelly and "Shaggy", but the same age as in the present day - clearly a sign of mistakenly used models time travel. In the post-film chat for "Is It Fall Yet?, someone asked "Who is that one guy with the eyebrow ring and and the skateboard in the background??" Daria responded: "That's "Skateboard Guy." Aren't you paying attention?" 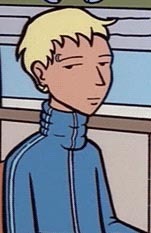 Josh usually appears as a background character without much to say, but he was given a major expansion in the "Ethan Yeager in Lawndale" series by Shiva. This page was last edited on 6 May 2018, at 00:40.